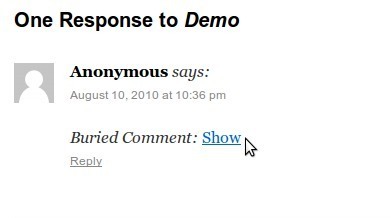 Downloadable via the WordPress plugin repository: ShushThatNoise – Ignorant Comment Hider, only compatible with WP3.01. Hide unwanted comments without deleting them. Edit the comment and wrap the offending text in [shush][/shush]. Readers can choose to read the hidden comment by clicking on the “Show” link. Bonus: You can also use this shortcode in your posts as a “Spoiler” hider. Well, it works nicely in preview for me! This entry was posted in WordPress and tagged plugins, WordPress.